Crazy me, in retrograde. Or why I no longer use my 34" UltraWide monitor. Also, I flutter about. I’m really happy with my upgrade to the 2018 12.9” iPad Pro with the Smart Keyboard and pencil. Like my upgrade from my Apple Watch 0 to Series 4, it is much more capable. So much that it has eaten further into the time I spend on my laptop. This isn’t about trying to replace my laptop with an iPad but about enabling me to work on a task whenever and wherever. I’ve never done well tied to a single desk or office. My productivity and creativity is spurred by moving around from den to kitchen to home office or from office desk to conference room to a break room. Coffee shops fit into the mix as well. It’s just what makes me tick and the iPad is a better much for much of what I do. I used to use my 9.7” Pro almost exclusively as a lap or handheld device. But with the additional time I spend on the iPad after upgrading along with the increased amount of “pro” work I use it for I’ve found I am opting to sit at a desk or table fairly regularly. 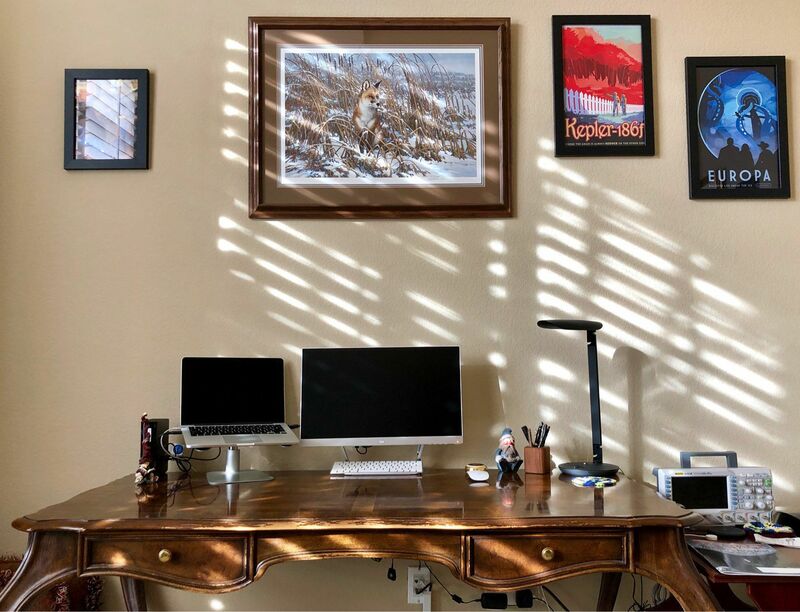 In my home office my MBP was connected to a LG 34” UltraWide monitor which provides an expansive viewing area for sure and was very handy in my days as a corp exec leveraging my ADHD to see and work on tons of things at one time. Now I’m back to running my own show I’ve worked to wean myself from what I consider to be bad habits and haven’t really been making use of the screen real estate. And the thing takes up a ton of real estate on my desk. So this weekend I replaced the LG with a 21” HP monitor my former employer had given me a couple years ago. I also moved my MBP from a position relegated to a side table it is now on a stand next to the monitor as a two-display setup. This combined with use of full screen mode in apps aids focus. I revisited which items had earned a place on my desk and stowed some of them to get a cleaner look and work surface. The result makes it much easier to plop down at my desk and use my iPad instead of the laptop and also to have the iPad off the right if I want to use both at the same time. I find clutter distracting and disturbing in a subconscious way so I’m pretty happy with this result. I have a few more things I may do but the picture shows what I ended up with. N.B. I would not buy anything from LG again, horrible warranty service.